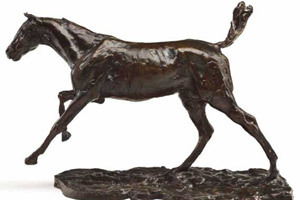 A horse bronze cast from a wax model crafted by renowned artist Edgar Degas is expected to fetch up to $US1.5 million when it is auctioned in New York next month. The piece, entitled Cheval au galop sur le pied droit, will be offered at Christie’s Impressionist and Modern Evening Sale on November 5. The artwork stands 35cm tall and is 46.4cm long. Christie’s pre-auction estimate on the work is $US1 million to $US1.5 million. Like all Degas’ works in three dimensions, it was originally modeled in wax and cast by Hébrard in a limited bronze edition only after the artist’s death, at the request of his heirs. The bronze, with a brown patina, was cast in 1923, six years after the death of Degas. It was part of an edition numbered A to T, plus two casts reserved for the Degas heirs and Hébrard, which are marked HER.D and HER respectively. The bronze sculpture is signed, numbered and stamped with foundry mark “Degas 47/J AA HEBRARD CIRE PERDUE” on the top of the base. The original wax model was executed by Degas between 1865 and 1881. The work is being offered for sale by a private collector. Cheval au galop sur le pied droit is the largest of all Degas’ surviving horse sculptures.